Yesterday I went to a Nutmeg Spinners Guild meeting for the first time. Having never been to a craft guild meeting before (or any guild, for that matter) I didn’t know what to expect and was weirdly nervous beforehand. However, I should’ve known better than to worry because like knitters, spinners are really nice people and I had a great time chatting about spinning with a bunch of interesting new people. I think my favorite thing about fiber-related gatherings is the diversity of people it brings together. Young and old, experienced and new, professionals and retirees, everybody mixes together easily and it’s really wonderful to watch. 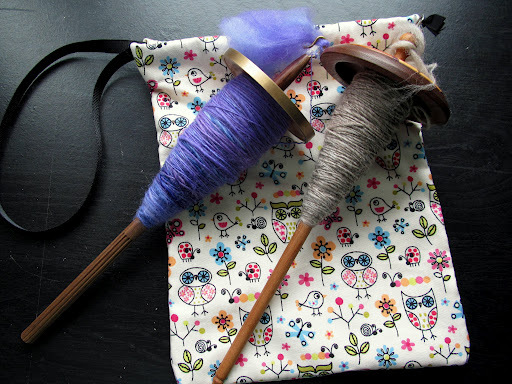 Just from watching other people spin I learned a lot about managing fiber, which is hard to pick up from books. I also learned a TON about the different kinds of spinning wheels and it was really neat to see so many different ones all in the same room. Did you know there are less expensive spinning wheels made from PVC pipe? I didn’t! I picked up the cute project bag in the background at the meeting! On the left is some Polwarth wool that I am about 1/3 of the way through spinning and on the right is the Merino wool I’ve been working on for my Spinner’s Study. If you have the chance to join a group like this, I’d encourage you to do so, it’s really inspiring to see the beautiful things people can create and it’s fun to connect with other crafters offline as well. If you are interested in testing this design, please let me know. You will need ~90 yards of super bulky yarn, size US 15 (10 mm) straight needles, and a couple of big buttons or a length of wide satin ribbon for finishing. 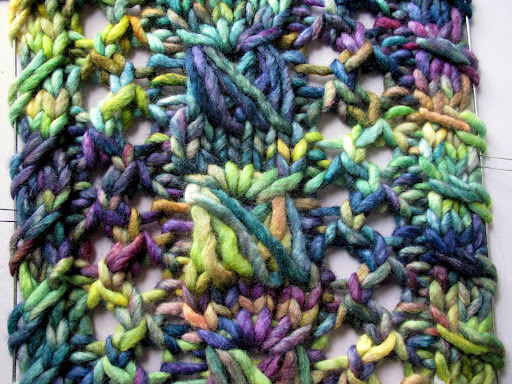 It took me one day to knit once I had it all worked out so it would be a quick one! This entry was posted in Malabrigo, MyDesigns, spinning by shoelaceswitcher. Bookmark the permalink. Oh lovely sneak peek, it looks lovely – those colours are amazing! Your spinning guild sounds awesome too! I love the purple handspun you are working on and SUPER jealous that you found a little group to spin with, that is so wonderful! I absolutely love what you ended up doing with the Big Mess, the colors are WOW, pretty much all of my favorites mushed together. Your spinning group sounds amazing. My aunt actually signed me up for her weavers and spinners guild here but I haven't had the time to attend, nor motivation. Maybe I should. Anyways, I love your big mess. The yarn meshes well with the pattern! Your yarns both look gorgeous! I love the purple so far! The big mess looks great and I can't wait to see it! Fiber guilds rock. I joined my local guild about a year ago and look forward to going every month because there's always something new to learn. I love how the slipped stitches on the cowl affect the color.